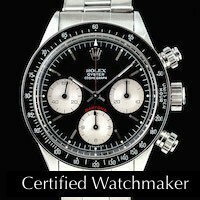 Watchmaking, High-grade restorations, Custom watches made and watch sales. Steven grew up in Washington State, USA, where he started his university studies in Business and linguistics. He then completed his Bachelors in Germany, where he met his German wife, Annette. Due to Steven’s passion for making and restoring things since childhood, he pursued an additional college degree in Watchmaking and his international AWI Watchmaking Certification. Steven learned many skills under some of the best master watch and clockmakers in the US and Germany. In 1999, he started his own watchmaking business, where he repaired and serviced thousands of watches and clocks in his home for several Rolex jewelry stores and private customers. He soon began to restore high grade time pieces and designed custom watches to his customers taste. After having moved to Germany, Steven worked at a Rolex and Patek Philippe Service Center at the well known Jewelry chain, WEMPE in Hamburg. There he repaired and serviced thousands of Rolex watches of every age and caliber. At the beginning of 2012 Steven & his wife, Annette, moved to Cyprus, where he re-opened his watchmaking business. His talent and specialization is to restore high grade watches to like new condition. Steven has a modern repair shop with the most up-to-date tools and equipment. He brings you over a decade of experience in the trade and offers you the highest quality repair and restoration on your timepieces.